A leading Catholic philanthropic organization, FADICA — Foundations and Donors Interested in Catholic Activities — has released a report citing some of the most innovative and successful programs around the world helping to confront the global refugee crisis. We are pleased and proud to report that one of CNEWA’s programs — the Mother of Mercy Clinic, run by the Sisters of St. Catherine of Siena and CNEWA in Zerqa, Jordan — was cited. Established in 1982, Mother of Mercy Clinic offers a wide range of general heath care services to thousands of patients…regardless of creed or origin. The clinic, however, specializes in prenatal and postnatal care, giving priority to needy mothers and their infants. As the clinic’s head doctor, Dr. Ghabeish has treated mothers and infants for years. “People like to come here because they know they will get quality service, that they will be treated in a clean environment run by good administrators,” said the 59-year-old doctor, a Palestinian refugee. Though only 20 miles northeast of Amman — the increasingly cosmopolitan capital of the Hashemite Kingdom of Jordan — Zerqa struggles with a multitude of problems: escalating crime rates, insufficient housing, inadequate infrastructure, pollution and poverty. Through the Catholic Social Innovation initiative, FADICA has identified Catholic models, approaches and organizations that are responding to the global refugee crisis by putting their faith into action and harnessing innovation. Catholic social innovation is not new; Catholic priests, brothers, sisters and lay people have been doing this work for centuries, but often under the radar. This study attempts to change that by spotlighting Catholic innovators and innovations. It also illustrates how Catholic social teaching (sometimes called ones of the church’s “best kept secrets”) informs and inspires innovation in Catholic ministries and organizations. You can read more in the full report at FADICA’s website. 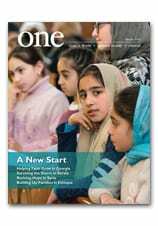 For more on the work of the Dominican Sisters in Jordan, read Finding Sanctuary in Jordan, Overwhelming Mercy and Mothering Mercy In ONE magazine. We are grateful to FADICA for recognizing the vital and invaluable work of the Dominican Sisters — and we are grateful, especially, to our donors who have made this sort of work possible and successful. Want to learn how to support these and other programs in Jordan? Visit this page. Artist Donna Slade had never set foot in a mosque before beginning work on the intricate calligraphy in Arabic that now decorates the arch above the central point in the worship space at the Tri-State Islamic Center. Slade, a member of Church of the Nativity in Dubuque, collaborated with Fayez Alasmary, a young member of the mosque, and Adib Kassas, a member of the mosque’s advisory board who serves as an imam. The trio perfected the curved lettering that expresses a verse from the Quran, the Muslim holy book. The artwork was a gift from the Catholic parishes of Dubuque to the Islamic community. Muslims have been present in the city for years, with the first permanent worship space opening in December 2016. Aref Khatib, Islamic Center president, explained that the gift has a deep significance for both communities. “It means to me bringing everyone together and realizing we should not be discriminating and we should not be judging one another. That’s God’s job, not our job,” Khatib told The Witness, newspaper of the Archdiocese of Dubuque. “When you look at the universe, everything is different color and different shapes, just like human beings are and that’s the beauty of Allah’s creation. We should embrace the diversity,” he said. The idea for the gift came from the Rev. Alan Dietzenbach, parochial vicar at St. Raphael Cathedral and St. Patrick Parish. The effort grew from the relationships built by John Eby, associate professor of history at Loras College and a member of the cathedral parish, through his work with the Children of Abraham. The organization encourages dialogue among Jews, Christians and Muslims. Father Dietzenbach hopes the art will serve as a lasting symbol of cooperation between the two groups. “I hope that this gift is a sign of solidarity and love and a reminder that religious freedom is a right we hold together as we strive to make our own community a place of peace, understanding, and kinship,” he said.